Rome is seriously sizzling this July with temperatures hanging around the 37° Celsius mark – that's about 98.6° Fahrenheit for US readers – and with humidity levels making it feel worse. So to torture myself a little, I thought I'd post a summery image of a dazzling blue sea! 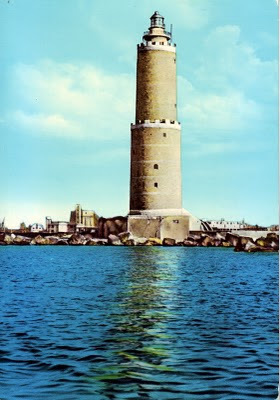 This postcard features the Lighthouse of Livorno (Il Fanale dei Pisani). Livorno is a major port located on the Northern Italian coast of Tuscany on the Mediterranean sea and this lighthouse – probably built by Giovanni di Nicola Pisano – has existed on the same spot since 1304, although the original lighthouse was completely destroyed in 1944 by the withdrawing German forces during the Second World War and was rebuilt in 1956 to match exactly the original construction and faced externally with as many of the original stones as possible. The structure is 47 metres high and has 11 floors reached via a spiral staircase, which is actually cut into the thickness of the inside wall – clearly not a climb for anybody suffering from vertigo! its summit though the winds may blast. 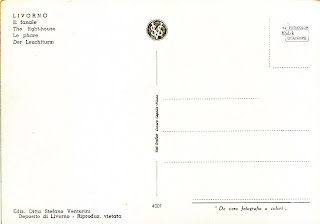 The postcard carries the name of both the Tuscan publisher - Stefano Venturini – and the Milanese printer – Cesare Capello – and also makes reference to the Deposito di Livorno (presumably an image archive). Whilst this is not a real photograph postcard it was printed from a genuine colour photograph on Kodak Ektachrome paper and bears the Kodak logo on the reverse. Originally launched in the 1940s, by the 1950s onwards Ektachrome film had been improved sufficiently to allow small professional photography labs to process images on-site and was used right through to the 1970s. 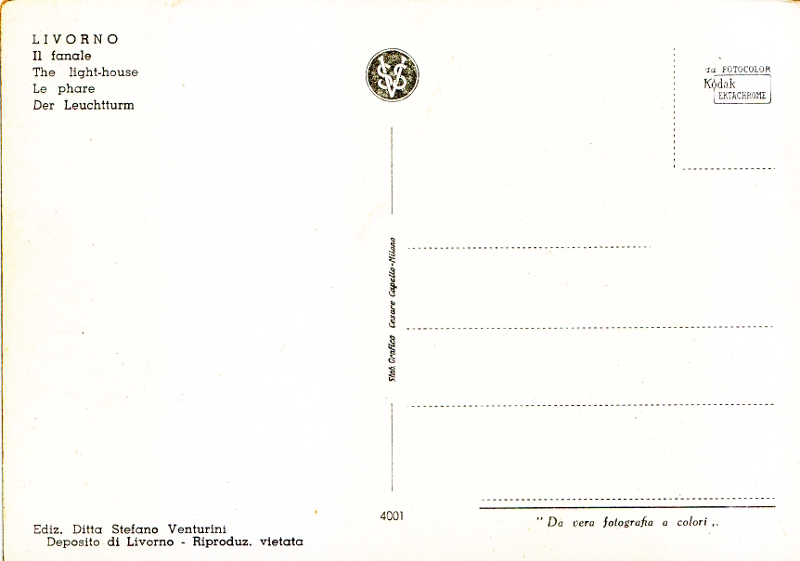 The postcard is uncirculated, but the version of the Capello logo printed on the reverse was certainly in use from the late 1950s and the classic look of the slightly gaudy colours probably dates this card to the first half of the 1960s when the newly rebuilt lighthouse was once again a local landmark. It's a wonderful lighthouse. I was just complaining about our lack of Summer weather, but I should probably stop or we'll be getting the 98 degrees plus temperatures too. I think it's about 62 right now.